Light oak wood register covers by Accord are your solution to replacing rusty vents. 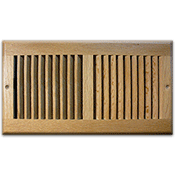 Our wall vent registers have a solid oak faceplate and are equipped with an adjustable heavy duty plastic damper. The faceplate is also pre stained in a light oak finish to save you time and money. These wood register covers can be used in places of high moisture, such as your bathroom or kitchen, because they won't rust. You'll find that wall vent registers are good to use whether you need to open or close off airflow in your home. The wood register covers have a 1/2" thick faceplate and on each side there is a pre drilled screw hole for easy installation. Screws are included with the purchase. Mount your wall vent registers either on your ceiling or your sidewall. Tip: When purchasing your wall vent registers, do not order according to your old registers measurements. You want to remove that vent from the wall and measure the hole opening. Your 10 x 6 wood register cover will fit into a hole opening of 10" x 6". Interested in metal wall vent registers? We have a choice selection for any style space. These wood register covers are a great alternative to boring metal. Order now to upgrade your vents!